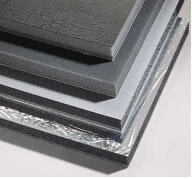 Our Soundproofing Composites are available in ¼” to 2″, in sheets / rolls. IMPORTANT! ALL our composites can be manufactured to meet ANY STC rating between 29 and 50! Just give us a call and we’ll be able to manufacture to your STC requirements. The STC ratings in the charts below are just for example and are the most common STC ratings for that particular product. All composites can be made to reach STC from 29 to 50! This is a combination of 1 ｼ” thick foam, then a 1/10″ QVC vinyl, and a 1″ foam faced with a protective aluminized mylar skin. 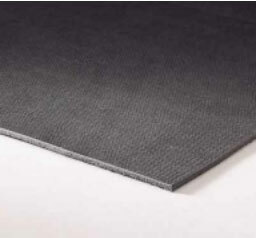 Ideal for enclosure linings where you need to both block sound from escaping and absorb noise trapped inside. 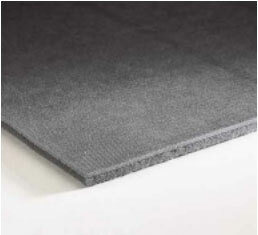 Our Acoustical Foam Barrier Composites to Reduce Noise and Sound Transmission in Machine Enclosures, Truck Cab Linings, Walls, and More. 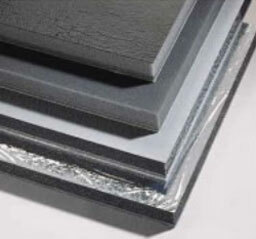 Strong, durable bonds between layers are created by casting the barrier directly onto the foam. 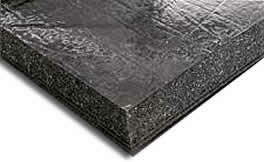 Acoustic Soundproofing Composites made of open-cell polyurethane acoustical foam. Choose from a variety of film facings and peel and stick backings. ANC-VB31 made of Mass Loaded Vinyl. 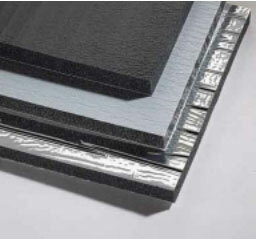 Please check out our Vinyl Sound Barrier Page for more details and all the available thicknesses. Under carpet to lower sound transmission between levels. Cut with a scissors and glue with silicone adhesive. Face the thicker foam side in towards the noise source. If glue won稚 hold the material, use firing strips.